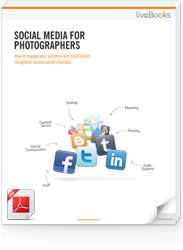 Looking for a way to grow your brand or photography business? You may be overlooking one free promotional opportunity – Google’s business listings. Whether you have a storefront or a home studio, you can reach more potential customers with a verified Google My Business Listing. This service helps put your business on the map (literally) and helps Google users see what is around them. You don’t have to have a brick-and-mortar storefront to own a verified listing – you can mark yourself as a “service area” business and hide your address from the map and search results. Once you have a verified Google My Business listing, you can personalize and edit the profile to better reflect your brand and reach your target audience. One way to expose your Google My Business profile is by taking advantage of Google’s attributes to describe your business. What are Google My Business Attributes? Google lets business owners identify specific services, features, or other qualities about their business to allow their listings to show up in relevant local searches. 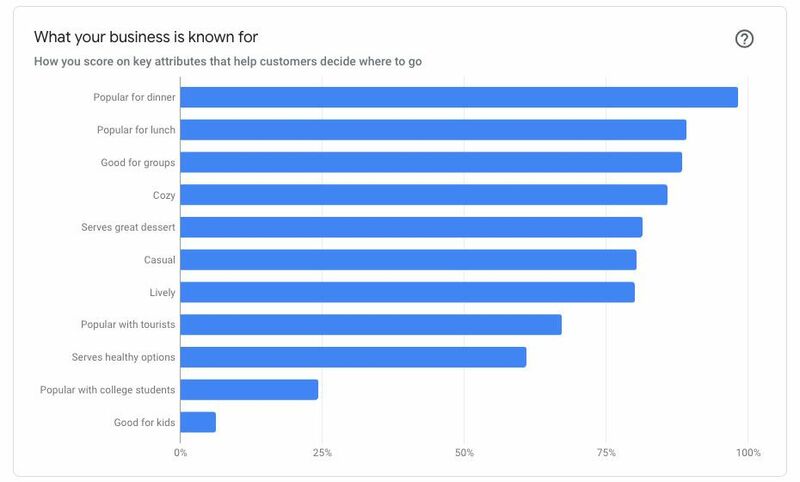 While many of these are crowd-sourced by Google users, business owners can add attributes themselves. The attributes appear on your business listing in search results and on Google Maps. 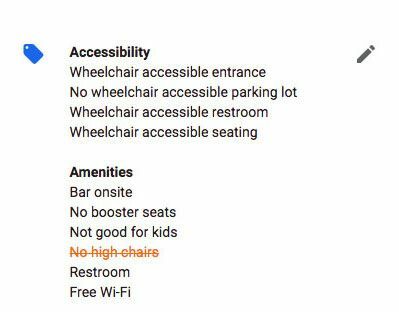 Some attributes, such as “Women-led” and “Outdoor seating”, show up as badge icons in mobile listings. As a business owner, you can select many attributes yourself. For example, if you run a floral boutique, you have the ability to select attributes that describe your services or product offerings. 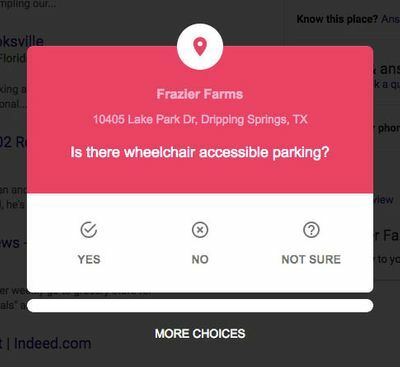 For example, you can specify whether your business has on-site parking or if the building is easy to spot from a car driving by. You should always describe your business as accurately as possible. Additionally, Google users can also select attributes that they believe describe your business. This can be done by clicking “Answer quick questions” in the listing. 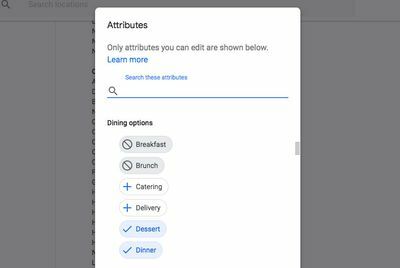 When users select these attributes, you are notified in your Google My Business dashboard. It’s important to stay on top of your profile to make sure that the suggested attributes are accurate. Above is an example of Google My Business’s crowd-sourced attributes feature from the search results. What does adding attributes do to my Google My Business listing? When you add attributes to your Google My Business listing, you increase the chance that your business will show up in more specific searches. 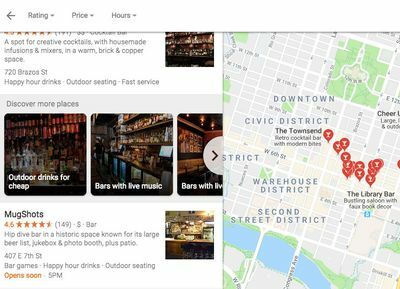 In the aobve example, a query for “bars near me” will also bring up some additional categories, such as “Outdoor drinks for cheap” or “Bars with live music”. This information is gathered via Google’s attributes feature. How do I add Google My Business attributes? To add attributes to your listing, log in to your Google My Business account. Once you navigate to your business listing profile, click on “Info” in the left-hand column. In the section below your primary listing information like your phone number and hours, you will see a blue “price tag” icon. Click on the editing pencil next to the blue tag to add or edit your business attributes. Below is a comprehensive list of Google My Business Attributes. The attributes that you are able to select depend on your business category. You can see what past customers and Google users think about your business by navigating to the “Insights” page on your Google My Business dashboard. Would you recommend this place for a vegan meal? Is this place good for a quick bite? Is this one of the top places in the metro area for cocktails? If you were looking for a healthy meal, would you choose this place? Does this place attract a trendy crowd? Would you recommend this place for a gluten-free meal? Would you consider this place inexpensive? Does this place have good dessert options? Is there usually a wait here? If you were looking for a vegetarian meal, would you choose this place? Does this place have good views? Is this place good for dining alone? Would you call this a cozy place? Is this an upscale place? Is this place popular with travelers? Is this place popular with university students? Is this a good place to bring young kids? Is this a casual place? Would you call this a romantic place? Does this place serve ice cream? Does this place have fast service? Is this place good for dancing? Does this place serve artisanal cocktails? Did you visit this place for less than $10? Would you call this place quaint? Does this place offer budget accommodations? Is this place good for a weekend getaway? Is this a lively place?